Frederick John Sharpe, known as Frank, was born on 4 June 1883 at Yeovil, the son of Annie Sharp (b 1865) originally from Sherborne and an unknown father. In the 1891 census 8-year old Frank was living with his grandparents, groom and gardener George Sharp and his wife Elizabeth at 4 Waterloo Lane. By the time of the 1901 census Frank was living with William and Hannah Hooper and their four daughters at 3 South Place in South Street. 18-year old Frank, now working as a grocer's porter, was listed as the stepson of William and Hannah. Frank's military career is somewhat convoluted; he joined the Territorials and served with the 3rd Battalion, Somerset Light Infantry. Around 1902, while serving with the Somersets, he worked as a groom and at this time enlisted at Sherborne with the 3rd Battalion, Dorsetshire Regiment (Service No 7135), signing up for a term of twelve years - three years as a regular soldier and nine years as a reservist. In the 1911 census Frank was listed at the Dorchester Depot Barracks at St Martin's Road, Dorchester, Dorset, with the regiment. In the spring of 1912 he married Laura James at Dorchester. They were to have two children and Frank was to find work as a warder at Dorchester Prison. As a reservist Frank was called up at the outbreak of war and joined the 1st Battalion, Dorsetshire Regiment. This was a Regular, rather than a Territorial Battalion. The 1st Battalion was in Britain on the outbreak of the First World War and so deployed straight to the Western Front. Mobilised for war, the Battalion landed at Le Havre on 16 August 1914 and almost immediately engaged in various actions on the Western Front including The Battle of Mons and subsequent retreat, The Battle of Le Cateau and the Affair of Crepy-en-Valois, The Battle of the Marne, The Battle of the Aisne and The Battle of La Bassée. In October 1914, II Corps of the British Expeditionary Force moved north from Picardy and took up positions in French Flanders where they were immediately engaged in the series of attacks and counter attacks that would become known as the ‘Race to the Sea’. Over the course of the next year most of the British activity in this sector focused on attempting to dislodge the German forces from their advantageous position on the Aubers Ridge and capture the city of Lille, a major industrial and transport centre which the Germans had occupied early in the war. The ridge is a slight incline in an otherwise extremely flat landscape from which the Germans were able to observe and bombard the British lines. The Battle of La Bassée (10 October – 2 November 1914) was fought by German and Franco-British forces in northern France during reciprocal attempts by the opposing armies to envelop the northern flank of their opponent - the Race to the Sea. The German 6th Army took Lille before a British force could secure the town and the 4th Army attacked the exposed British flank at Ypres. The British were driven back and the German Army occupied La Bassée and Neuve Chapelle. Around 15 October, the British recaptured Givenchy-lès-la-Bassée but failed to recover La Bassée. 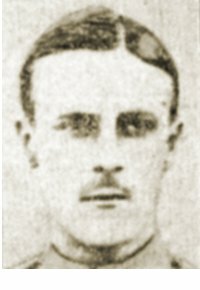 Frank was posted missing and presumed killed on 13 October 1914. He was aged 31. In its edition of 10 March 1916 the Western Gazette reported "The intelligence was on Thursday received by Mrs Hooper, of 74 Eastland Road, that her son Private Frederick Sharpe, of the 1st Dorset Regiment, had been killed in action. Private Sharpe was recalled to the Colours on the outbreak of war, he being at that time a warder at Dorchester Prison. He was posted missing on October 13th 1914, and, in the absence of further information, the War Office communication stated that the authorities were regretfully constrained to conclude he was dead. Deceased, who was 34 years of age, leaves a widow and two children." 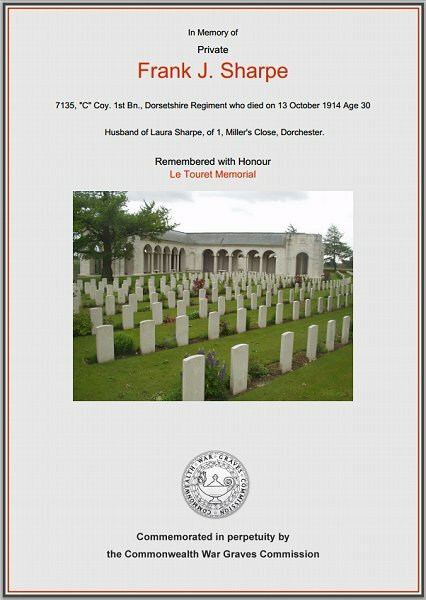 Frank Sharpe is remembered on the memorial at Le Touret, Panels 22 and 23, and his name is inscribed on the War Memorial in the Borough, albeit as Sharpe, F rather than the more correct Sharpe, FJ. The Commonwealth War Graves Commission certificate in memory of Frank Sharpe.